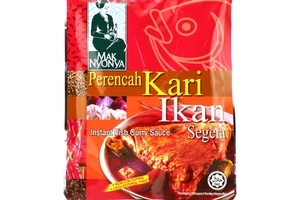 Mak Nyonya Instant Fish Curry Sauce Mix (Perencah Kari Ikan Segera) in 7oz (200g) sachet.Maknyonya is proud to present, a simplicity in cooking, an easy to present, convenient, tasty as well as delicious in collections of Nyonya sauces. It is the most relaxing way to preparing an easy-to-cook Nyonya delicacy to fill up your family members under the warm environment to enjoy a flavored unique Nyonya food. Product of Malaysia. The Nyonya delicacy is an interesting amalgamation of Chinese and Malay dishes originated from Malacca over hundreds of years ago. Back to our ancestors, the secret recipes of Nyonya foods has been a unique culture and has been handed down over the generations. There is no simplicity to preparing a warmth and delicious Nyonya food without its original flavors and from preferring the most superior food materials and spices with the best quality in its class. onion, lemongrass, chilli, spice, ginger, salt, and edible oil (palm oil).